Manchester City are likely to recall all-time top scorer Sergio Aguero, who was an unused substitute against Shakhtar Donetsk on Wednesday. Kevin de Bruyne, Eliaquim Mangala and Claudio Bravo are long-term absentees. Manchester United will give a fitness test to Romelu Lukaku, who has missed their last two league and cup games with an unspecified injury. United will also monitor Paul Pogba, who missed training on Friday with what is believed to be a minor injury. Diogo Dalot has been out with an injury sustained during the international break, while captain Antonio Valencia is back in contention having travelled to Italy for the midweek game against Juventus. @Guymowbray: Both clubs proudly flew the Premier League flag in the Champions League this week, but whose will be hoisted over Manchester until they meet again? ‘Sixy’ City were sensational against Shakhtar, and if they play again as they have been doing then their first derby win in four at home is more than likely. Whatever United’s plans, they must involve what has been a problem for most Etihad visitors, and that is staying in the game. For all United’s recent comeback exploits, it won’t happen every time, and after last time here Pep Guardiola would make absolutely sure it couldn’t again. His team is magnificent right now, whilst the ‘Special One’ has his mojo back and is looking forward to a “special” game. As are we all. Manchester City manager Pep Guardiola on United: “No doubt they’ve improved. If they can win in Turin, it shows how strong they are. “It doesn’t matter if [our] confidence is good – it’s always complicated. Throughout the history United have beat City more. “They have incredible talent up front and in the middle as well. Manchester United manager Jose Mourinho: “If we keep conceding [opening] goals the day will arrive where we cannot come back. United fans might be optimistic because of their win at the Etihad towards the end of last season, but I don’t see that happening again. I don’t see City winning either, though. I usually always fancy them so much to win at home, but with United being so resilient I am going to go for a draw. Manchester United can win back-to-back league games at the Etihad Stadium for just the second time. The only previous occasion came in the 2008-09 and 2009-10 seasons. City have won two of eight matches against Manchester United in all competitions (D2, L4) since recording four straight victories between 2013 and 2014. The Red Devils are unbeaten in their last three league visits to the Etihad (W2, D1), keeping two clean sheets. Since losing the Manchester derby in April, they have taken 25 league points from a possible 27 at the Etihad Stadium, scoring 32 goals and conceding just four. City conceded three second-half goals in that derby defeat – but in their subsequent 18 league matches they have conceded just once after the break, with that goal scored by Wolves’ Wily Boly (via his hand). They are unbeaten in 53 top-flight matches against sides who began the day outside the top four since a 4-0 loss at Everton in January 2017 (W44, D9). Pep Guardiola has never lost consecutive home league games against a single opponent in his managerial career. 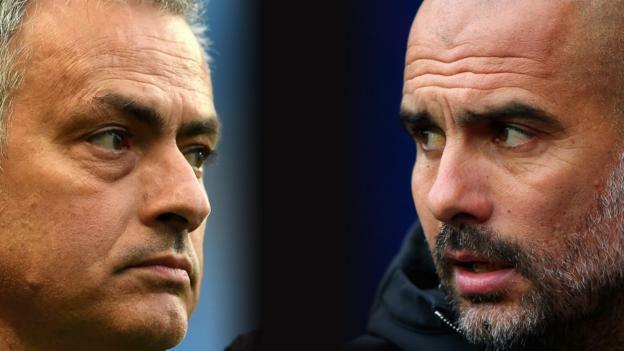 Guardiola has won nine of 21 games against Jose Mourinho-managed sides in all competitions (D7, L5). Sergio Aguero has scored 17 goals and set up a further five in his last 13 Premier League games at the Etihad Stadium. Aguero scored seven goals in his first seven top-flight matches versus United but has failed to net in his last three against them. Raheem Sterling has failed to score in all 12 of his Premier League matches against Manchester United despite attempting a total of 19 shots. United have kept just one Premier League clean sheet this season, conceding 18 goals in 11 matches. It took them until 31 January – and 25 games – to concede as many last term. Their club record for most goals conceded after 12 Premier League fixtures is 20, in 2001. The last time they conceded more than 20 in their opening 12 top-flight games was in 1966 (21 goals). The Red Devils could win three successive top-flight matches for the first time since a five-game streak last season, which included April’s 3-2 victory at the Etihad Stadium. This will be Jose Mourinho’s 300th Premier League match as a manager. He has won 189 games in the competition, with 67 draws and 43 defeats. A Juan Mata goal would make him the fifth Spaniard to score 50 times in the Premier League. Anthony Martial can become the seventh different player to score in five consecutive Premier League games for the club, emulating Eric Cantona, Dwight Yorke, Ruud van Nistelrooy, Wayne Rooney, Cristiano Ronaldo and Robin van Persie.